I've been bringing lunch a lot lately, mostly for waistline purposes. It's not wise to chase a round of custards and cupcakes with burgers and fries; unless that burger is from Shake Shack, that's a different story. But I digress. Yesterday, I found myself with no lunch, and a sapling of a thought about joining Murray's Real Salami and Corrado Bakery into a harmonious union. Wonder who planted that seed? At 12:45 sharp, Brownie and I walked to Murray's Real Salami counter, two women on a mission. After chatting with the counter person (butcher? 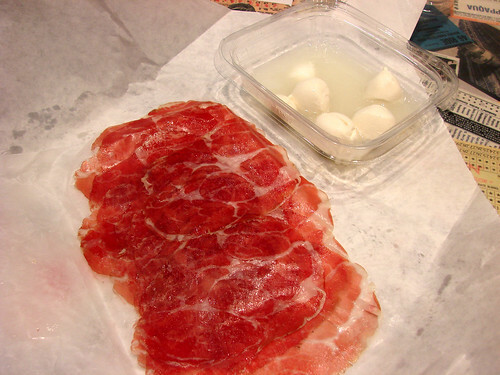 ), receiving a small lesson on ham, sampling speck and coppa, we chose to get 1/4 pound (the minimum there) of the coppa. It's dry-cured pork shoulder with a little spicy kick to it. 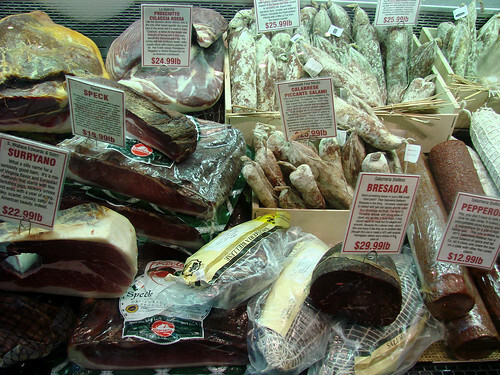 For more info on Italian meats, click here. At $19.99/pound, it was in the middle-range of meats there. For $5, we got a good amount of paper-thin coppa, enough for two sandwiches. While Brownie procured the meat, I snapped up a fresh sandwich roll. Corrado does tend to hide theirs; they are on the right side of the case, nestled by the large loafs. At $1.50 each, they are the perfect for soup or sandwiches. 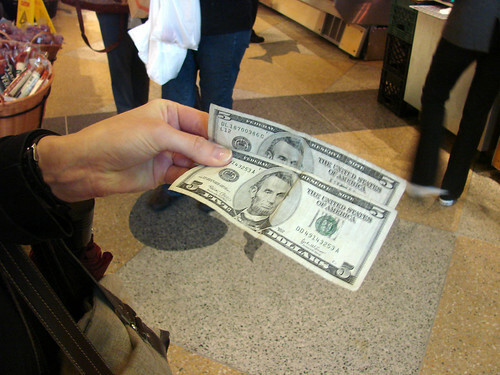 But we needed something else to finish up these lunches, and we only had $3.50 left. Hmm, how about some cheese? We went off to the other Murray's counter, looked at our selections, Brownie casing the main case, me focusing on the refrigerated one, I spotted mini buffalo mozzarella for $2.99. 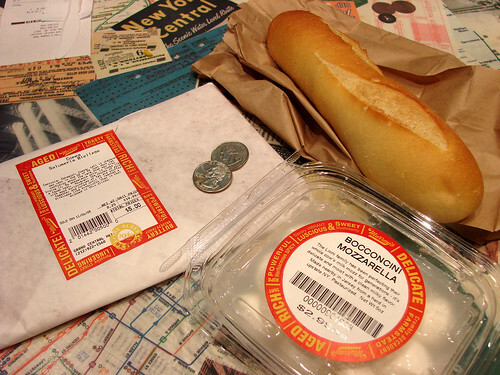 Perfect, fresh bread, fresh mozzarella, meat, and 50¢ left over. We proceeded downstairs to eat. Our sandwiches were delicious and satisfying, and best of all, there were leftovers for a quick afternoon snack or, even better, another sandwich. Of course, the combinations for this are now endless, with all the different stalls and offerings in the market, it's definitely doable to get the quality ingredients for a great sandwich for under $10. PS I'm not sure if they make them sandwich/roll sized, but Zaro's - which is near the Murray's Cheese in Grand Central - has really good ciabatta, too. 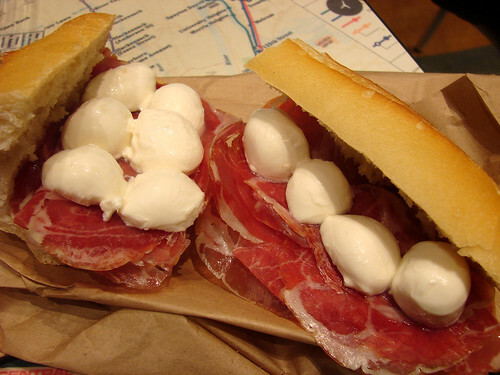 You almost had me going there, by writing mini buffalo mozzarella in your post. Unfortunately they aren't (blew up the package label - regular cow mozz), or I'd have a sandwich for life!